This was my first home computer -- serial number 0028687. 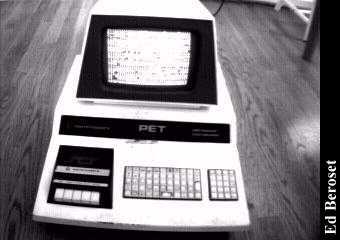 The PET-2001 (for the somewhat fanciful "Personal Electronic Transactor"), powered by a 6502 microprocessor was Commodore's first computer. (Unless you count the KIM-1 -Tom) It featured built-in BASIC and a machine language monitor in 14K of ROM, integrated CRT and keyboard, and cassette tape drive for mass storage, and IEEE-488 port all wrapped up in a very sturdy sheetmetal case. Originally offered for sale with either 4K or 8K of memory, Commodore's early production of this computer was plagued by supply problems, especially with the "chiclet" style keyboard which was manufactured in Taiwan. I had originally ordered a 4K model in October, 1977, for $495 and waited many months, calling the distributor every couple of weeks to get an update on where I was in the queue. In May of 1978, the distributor informed me that Commodore was no longer offering the 4K version, and so I had a choice -- either pay an additional $300 for the 8K model or get my money back. For my birthday that year, my father kicked in the additonal money and I finally received the machine in August 1978. The comments on the following pages are all Ed's. Enjoy! CompuDudes in Elkins Park, PA sent me a picture of their Pair 'o' Pets. 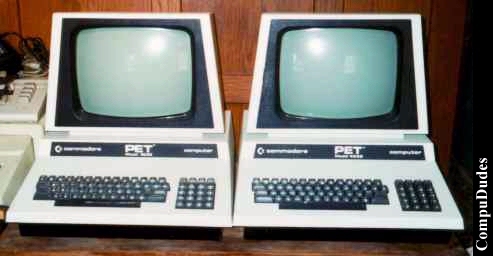 Click here to view all comments for the Commodore Pet and to leave your own.